Cosmo5 is an infrastructure project management software industry-focused (EPC contractors) that integrates information coming from engineering, materials management, procurement, project management and other sources, combining them to perform prefabrication analyses, site warehouse management, prefabrication and construction progress monitoring. Warehouse management is a key factor in the supply chain management and primarily aims to control the movement and storage of materials within warehouses at the construction site and to process all the transactions, including receiving, storing, transferring and picking. The system also directs and optimizes the stock quantities based on real-time information from the procurement system. 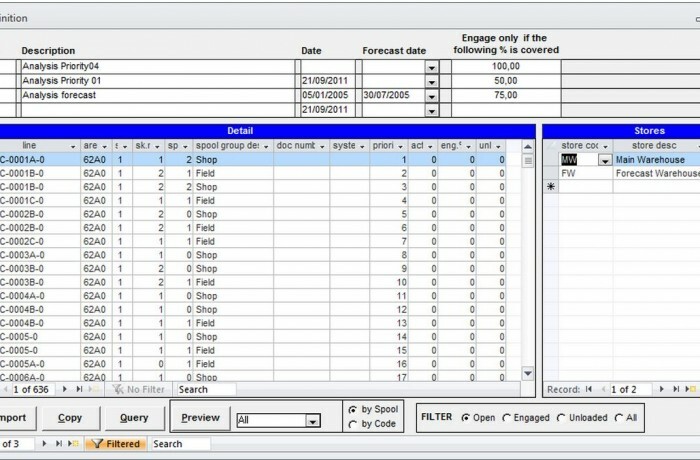 Real time feasibility analyses are calculated on the basis of the components found in the Material Take Off (imported from Puma5 or any other material management system) and of the availability of the material stored in the warehouses; forecast analyses can also be performed using the quantities and the delivery dates indicated in the Packing lists and in the Purchase orders; materials on the analyses can be engaged, thus making them not available for different analyses. Progress monitoring can be performed on prefabrication, installation and every other activity that the company wants to monitor. The workflow is fully configurable: activities can be determined by the user and, for each one of them, the percentage of the overall progress can be defined. Progress reports are fully configurable by the user.